Bath Croquet Club’s new season has started brightly with a team captained by Paul Francis winning promotion to Division 1 of the South West Federation Short Croquet tournament held at Nailsea on Sunday. In the first 2 rounds of matches the Bath team of Francis, Richard Stopforth, Timothy Cantell and Ian Morrison recorded just 2 wins out of 8. Clearly refreshed by lunch, the Bath team stormed to a 3-1 victory against a strong Nailsea team. Then in the final round Bath recorded a superb 4-0 victory. This great recovery meant the team ended frustratingly just one point behind eventual Division 2 winners Nailsea. Second place was however enough to win promotion to Division 1 for next season’s tournament. 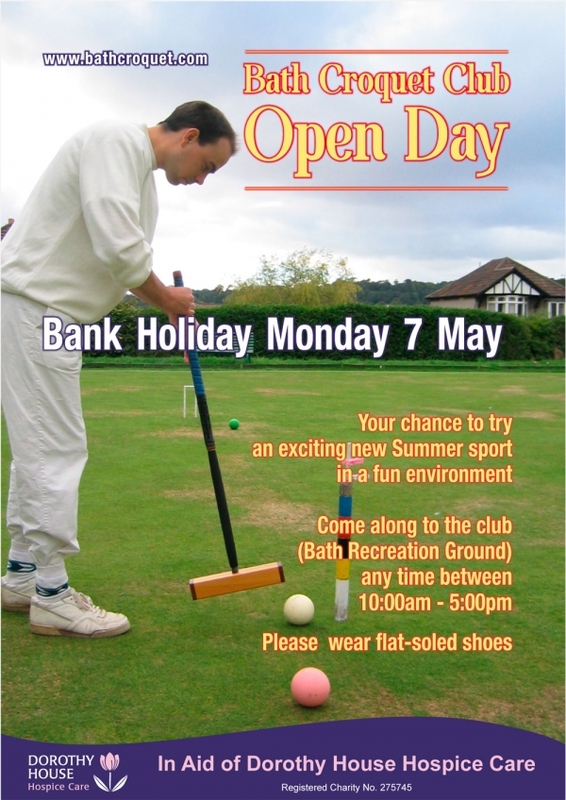 The club’s Open Day in aid of Dorothy House took place on Bank Holiday Monday 7 May. Despite disappointing weather in the morning a brighter afternoon meant plenty of people turned out and enjoyed getting a taste of croquet at the same time as sampling Dorothy House’s delicious cakes. The club also ran 2 fun competitions with prizes going to the best visitors.